The latest estimate of gross domestic product (GDP) growth in the first quarter of 2016 was unchanged at 0.4%, though the level has been revised down fractionally. This quarter’s growth marks an easing in the pace of growth in recent quarters – during 2015 quarterly growth averaged 0.5%. The annual cycle of Blue Book improvements and revisions has resulted in both upward and downward revisions to annual GDP growth for the past 6 years, but the broad path of the recovery is broadly unchanged. GDP is now estimated to be 7.0% higher than the pre-downturn peak (Quarter 1 (Jan to Mar) 2008), rather than 7.2% as previously estimated. The saving ratio has been revised up in 2014 and 2015 – partly due to new HM Revenue and Customs (HMRC) information on wages and salaries. As a result, the downward trend in household saving appears to have slowed somewhat compared with previous years. There has been a divergence between services and goods inflation, with services price inflation being relatively stable, around 2.5% since late 2013 – not far below its long-term average of 3.6% between 1994 and 2013. Male and female unemployment rates were both 5.0% in the 3 months to April, following a sharper fall in male unemployment than female unemployment since early 2013. This is the first time male and female unemployment rates have been the same since records began. House price growth and earnings growth have both picked up since the downturn, but at different paces, so that housing affordability has been deteriorating since 2013. House-price-to-earnings ratios are not quite back to where they were prior to the economic downturn but have been rising over the past 3 years so that house prices are now, on average, 8 times average weekly earnings (annualised). Q1 refers to January to March; Q2 refers to April to June; Q3 refers to July to September; Q4 refers to October to December. The economic indicators covered in this edition of the Economic Review relate to the first few months of 2016 – GDP covers the first quarter, labour market data relates to the February to April period, inflation covers May, and so on. During the months, quarters and years covered in this analysis, the economy continued to perform relatively well. Although GDP growth has eased in 2015 and 2016, the pace of growth has been solid compared with other advanced economies, and compared with the period of more modest growth up until 2012. Household consumption continued to grow strongly in 2015 and early 2016, increasing by 2.6% and 2.8% respectively, remaining a main driver of GDP growth. Inflation remains very low at 0.3% in May 2016, but has moved slightly away from the 0.0% average of 2015. Goods inflation continues to be negative and much more variable than services inflation, which has been steady at around 2.5% since mid-2013. This divergence in rate and path partly reflects differences in exposure to international markets and therefore competitive pressures. The low rate of inflation suggests that there is still a reasonable amount of spare capacity in the economy and that there is competition in domestic markets to capture consumer spending, even though household consumption has been growing consistently for some years now. Low inflation also boosts household disposable income and the spending power of earnings. The labour market remains strong by historic standards, with employment high and unemployment low. However, this is not feeding through to cost-push inflationary pressures, sharply rising labour costs or stronger growth in earnings. This perhaps reflects the structural shifts of increasing flexibility and the supply of labour in the labour market. Indications of these kinds of structural shifts include more part-time working, more self-employment, and the rising participation of women and older workers. The unemployment rate among men and women continues to fall and is now,for the first time since records began the same at 5.0%. House prices have continued to rise through to April 2016, though the pace of growth eased between late-2014 and late-2015 and has recently picked up slightly. As a result of house prices rising at a much faster pace than earnings, the house-price-to-earnings ratio is now around 8.1 on average across the country, which is only just below the average ratio in 2007 before the economic downturn. However, because interest rates and therefore borrowing rates have been exceptionally low, mortgage payments make up a relatively low share of household income. This edition of the Economic Review reports and comments on our recent figures on the economy, covering the first quarter of 2016 in detail, together with early information for April and May. Respondents to our surveys during this pre-referendum period have not so far indicated that the referendum has had much effect on the figures in their returns. We will shortly be publishing statistics covering the period after the referendum on 23 June. The table below sets out the dates of publication of our main economic statistics that cover – in part at least – the post-referendum period and that will be released over the month ahead. A fuller table in the Annex shows the dates when any potential impact from the recent EU referendum may feed through to our economic statistics over a longer time horizon. We will accompany each release with relevant information to ensure as far as possible that users are able to interpret the figures correctly. The Quarterly National Accounts (QNA) indicated that the UK economy grew by 0.4% in Q1 20161, unrevised from the previous estimate. UK GDP is now estimated to have grown in each quarter since Q1 2013 – the thirteenth quarter of continuous economic expansion. The latest edition of QNA incorporated a range of methodological improvements, re-basing of reference years and new or revised survey data, resulting in some small revisions to the path of GDP growth (Figure 1). The most notable of the methodological improvements is the way owner-occupied imputed rental is calculated, which brings UK practice on this particular aspect in line with international best practice. The revisions to imputed rental have affected the level of GDP in current prices, raising its level while reducing the growth rate. Real GDP growth by contrast is relatively little affected by this change in most years. Changes to imputed rental also have a prominent impact on household income and expenditure, which are discussed further down this article. Revisions to GDP growth have been upward in 2010, 2012 and 2014 but downward in 2011, 2013 and 2015, so that the broad picture of economic growth in recent years remains very similar to the previously published GDP growth path. In the last 4 quarters, there have been small offsetting revisions, such that the quarter on quarter a year ago GDP growth in Q1 2016 remained at 2.0%. Overall, these changes mean that UK GDP is now estimated to have been 7.0% larger in Q1 2016 than in Q1 2008, compared with 7.2% in the previously published data. The changes introduced in Blue Book 2016 affect some of the expenditure components of GDP to a greater degree than others. Figure 2 plots the contribution from each headline expenditure component to the revision to calendar year real GDP growth, to show the drivers of the revisions. It highlights that household consumption (household final consumption expenditure, HHFCE) – the largest component of the expenditure measure of GDP – makes the largest or joint largest contribution to the revision in 13 of the 18 years presented, and has a notable impact on 2010 and 2011. This is to be expected, given the scope of the imputed rental change previously mentioned. The revisions made to household final consumption expenditure also have an impact on the household saving ratio. As the saving ratio is calculated by dividing gross saving by household total resources, this can lead to large revisions in the saving ratio, even if the revision to gross saving is relatively small. For example, changes to estimates of imputed rental will affect the estimates of household resources (income) and consumption, which may be partially offset in the numerator, but will have a greater impact through the denominator. 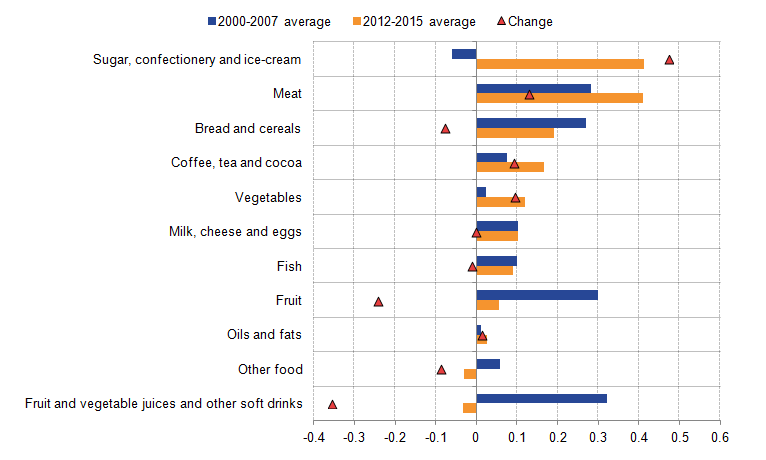 The effect of this is more apparent in the years prior to 2010 as household consumption and household resources both saw large upward revisions, leading to small downward revisions to the saving ratio (Figure 3). In 1997, the saving ratio was revised downwards by 1.2 percentage points, despite the revision in gross saving being relatively small. 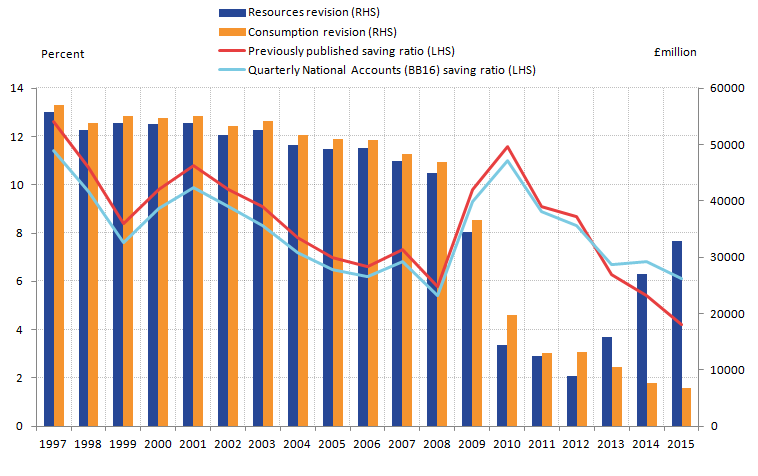 In contrast, in 2012 the saving ratio was revised down by 0.4 percentage points, despite the larger revision to gross saving. This is a result of the smaller scale of the revision to household resources. From 2013 onwards, there were larger upward revisions to resources than consumption, resulting in upward revisions in the saving ratio, ranging from 0.4 percentage points in 2013 to 1.9 percentage points in 2015. Although a significant proportion of the revisions to household resources and consumption are due to the improved method of estimating the imputed rental of owner occupiers, there are other changes that affect the saving ratio. This includes methodological changes for estimating value added tax (VAT) fraud and improvements to own account construction, which are discussed in the article Detailed Assessment of Changes to Sector and Financial Accounts: 1997 to 2014. In 2014 and 2015 there are much larger upward revisions to resources than consumption. This was partly driven by upward revisions to wages and salaries as a result of the take on of later HM Revenue and Customs pas-as-you-earn (PAYE) data, though this upward revision was partly offset, from 2015 onwards, by an improved method for estimating wages and salaries that generated downward revisions. This was alongside larger revisions to gross operating surplus and smaller revisions to consumption expenditure affected by the imputed rental methodology changes. The saving ratio was 5.9% in Q1 2016, slightly up from 5.8% in Q4 2015. This was driven by rises in net property income, compensation of employees and other small movements in the accounts, partially offset by a rise in taxes on income and wealth, as well as final consumption expenditure. This latest estimate of the saving ratio is still above the 4.3% recorded in Q1 2008, indicating that households still have a greater proportion of their income available to save than prior to the economic downturn. While the saving ratio fell fairly quickly from its post downturn peak of 11.5% in Q1 2010 , following the latest revisions, the saving ratio has stabilised around 6% since the start of 2013. This has been a result of increased growth in household income, which started to match the growth of consumption expenditure. There was also slower growth in consumption expenditure in 2015 (nominal terms), which may be partly due to low inflation. This allows households to consume the same volume of goods and services without increasing their expenditure. While the saving ratio is one indicator of the position of the household sector, household debt can give more information on the financial health of households. Household debt is important, as it shows how exposed households are to changing economic conditions. If households are holding high levels of debt relative to their income levels, they may be vulnerable if interest rates were to rise, especially if they suffer a reduction in income or economic conditions worsen. Prior to the economic downturn, household debt increased at a much faster rate than disposable income. From Q1 1997 to Q1 2008, disposable income grew at a compound average growth rate of 1.0% per quarter, while household debt increased by 2.3% per quarter. This caused the debt-to-disposable-income ratio to increase from 96% in Q1 1998 to 160% in Q1 2008 (Figure 4). While households increased their short-term loan debt over this period, the majority of the increase in household debt has come from loans secured on dwellings, as in mortgages. 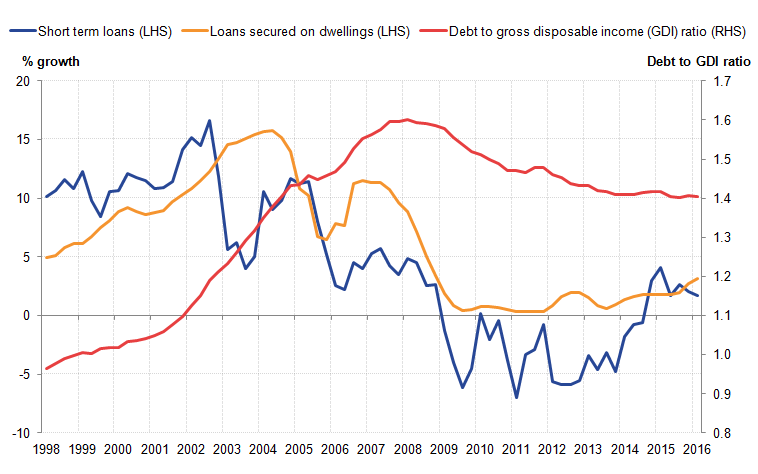 The growth in household debt partly reflects the relatively easy access and availability of credit to households. Following the onset of the economic downturn, the growth in household debt moderated, as tighter credit conditions and reduced confidence about economic prospects restricted household borrowing. In particular, short term loan debt fell 19.2% between Q2 2008 and Q4 2013, while loans secured on dwellings continued growing. As households restricted their borrowing, the debt-to-gross-disposable-income ratio fell from the peak of 160% in Q1 2008 to 141% in Q4 2013. In recent quarters, households have started to increase their borrowing once again. From Q4 2013 to Q1 2016 short-term loan debt has increased by 6.0%, while debt secured on dwellings has increased by 5.3%. Focussing on the latest quarter, debt secured on dwellings has grown by 3.1% compared with 2015 Q1; the fastest rate since Q4 2008. Part of this recent increase in secured debt may be due to various “Help to Buy” schemes allowing more households to purchase their first house. The pick-up in the last 2 quarters may also be a result of new stamp duty legislation which was introduced on 1 April 2016. The legislation increased the rates of stamp duty for buy-to-let property purchases, so many investors may have brought forward their property purchases in order to avoid paying the higher rates. There was evidence of this in HMRC house transaction data, where property transactions increased by 42% between February and March 2016 to 153,300, compared with a monthly average of 102,095 transactions in 2015. While lending secured on dwellings increased less quickly, some of this increase in debt may have been a result of the stamp duty changes. 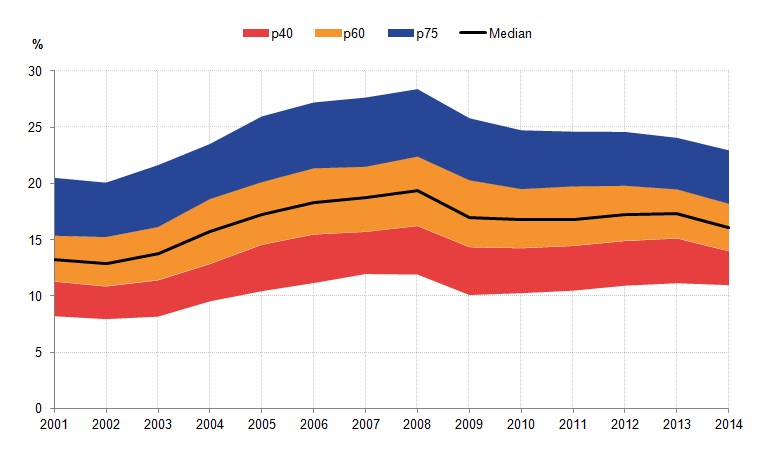 Chained volume measure (percentage points) between 2000-2007 and 2012-2015. While the trade deficit makes up a large part of the current account deficit, it is the deterioration in the primary income account that has driven the deterioration in the current account. The primary income account is made up of 3 components – compensation of employees, investment income and other primary income – but it is the investment income that makes up the largest part. Since 2011, the rate of return on UK assets abroad has been falling (credits, Figure 10), and so the income earned from UK assets held abroad has come down sharply, despite the UK’s holding of assets abroad being relatively stable, compared to foreign ownership of assets in the UK. Conversely, the return on UK assets held by foreign owners (debits) has been much more stable, and although it deteriorated gradually between 2011 and 2014, it has risen in 2015 and 2016 Q1. The gap between investment income credits and debits has widened markedly between 2015 Q3 and 2016 Q1. The headline rate of consumer price inflation remained steady at 0.3% in May 2016, having been at or close to this rate since November 2015. This marks something of a pick-up, albeit small, from the average for inflation of 0.0% during 2015. Despite this slight up-turn in recent months, inflation continues to stay very low by historic standards, and well below the Bank of England’s 2% target. A distinctive feature of the path of inflation is the dichotomy between goods and services inflation. The stability and relative strength of services inflation compared with the low and more volatile inflation path for goods provides some evidence of the impact that international trade and competitive pressure have on prices and inflation. While some services can be traded internationally, such as financial, legal and business services, there are some that clearly cannot be traded. Goods, on the other hand, can be readily traded and with world trade increasing and regional assembly or production chains becoming increasingly globalised, goods are subject to a much greater level of competitive pressure. In addition, goods production has become less labour intensive and can also be located where labour and other inputs are cheaper than in the home consumption market. Both inputs and outputs of goods are subject to much greater competitive pressures than is possible for services. In addition to the relative paths of goods and services inflation, Figure 11 shows the mix is amplified in the headline rate because the weight of services is lower than the weight attributed to goods inflation. Although the weight attributed to services in the inflation basket has been rising, from 298 parts per 1,000 in 1990 to 483 in 2016, it nevertheless still accounts for less than half of the inflation “basket” of goods and services. Figure 12 illustrates that services inflation has tended to make a relatively stable contribution to headline inflation, whereas goods inflation has made a much more variable contribution over the past 2 and a half decades. Figure 13 breaks down the services contribution into its constituent parts. It shows that recreation and personal services tend to make the biggest contribution to services inflation, followed by miscellaneous and other services, which includes medical and education services. Housing services, which covers rent, primary housing services and other housing services, makes a relatively small contribution to inflation and yet for many households these services make up a sizeable share of their expenditure. Although this category carries the second-highest weight of the 5 services sub-components, its weight is less than half that of recreation and personal services – the category with the highest weight. 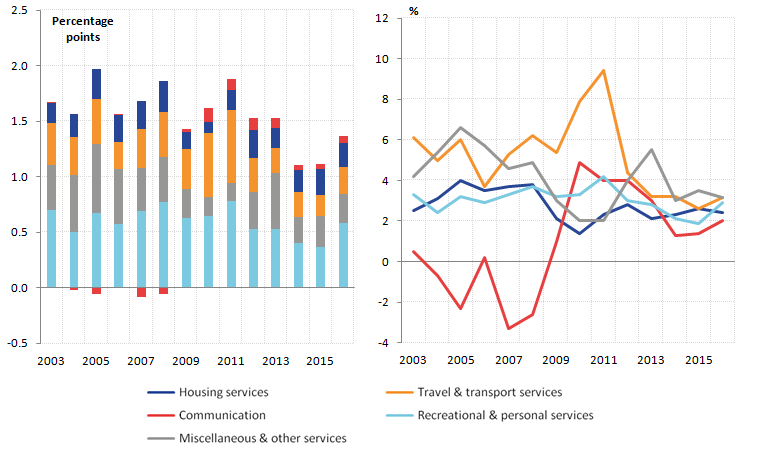 Its lower contribution to inflation is also due to more modest inflation since 2009 compared to some of the other services categories (Figure 13). Communications services, which are largely made up of telephone and telefax services, have been rather volatile over the period shown, but because of its relatively low weight, that volatility does not carry through to having much impact on services inflation as a whole. The volatility in the communication inflation profile is perhaps because of the inherent rapid pace of change in this sector and the fluidity of the telecoms market. This analysis serves to illustrate that an important, but possibly not primary, factor determining the path of prices of goods and services is competitive pressure holding down the cost of material inputs and labour, as well as access to markets where these factors of production are more abundant and therefore lower in price. The UK labour market continued to show its strength in the 3 months to April 2016, with the employment rate among those aged 16 to 64 increasing to 74.2%, up from 74.1% in the 3 months to January 2016 and 73.4% over the year. While both the male and female employment rates increased in the 3 months to April 2016, a greater proportion of the increase in employment over the year can be attributed to the male employment rate which increased by 1.0 percentage point, while the female rate increased by 0.5 percentage points. The inactivity rate for those aged 16 to 64 remained unchanged at 21.8% for the 3 months to April 2016 compared with the 3 months to January 2016, and was 0.4 percentage points lower than for the 3 months to April 2015. Figure 14 shows that the unemployment rate for those aged 16 and above has continued to improve in recent months, falling from 5.1% in the 3 months to January 2016 to 5.0% in the 3 months to April 2016, which is the lowest level recorded since mid-2005. In terms of the total number of people unemployed, there are now fewer unemployed people relative to the pre-downturn period (Q2 2008), and this continuous fall in unemployment reflects positive contributions from each age group. Taking a longer-term perspective on the make-up of unemployment, Figure 14 shows that the unemployment rate among men has been persistently higher than that for women since 1980. However, the margin of difference in unemployment rates between men and women has varied over time, with the unemployment rate very similar in some years but with as wide a difference being as wide as 4.5 percentage points in the early 1990s, when the male unemployment rate reached 12.7%. The unemployment rate for men and women has been very similar since late 2013, and for the first time since records began, the unemployment rate for men and women has coincided in early 2016 at 5.0% (February to April 2016). The economic downturn led to an opening up of the gender unemployment gap, as more men were made redundant and more women joined the labour market, partly due to their tendency to work more in part-time and temporary posts. The gap increased from 0.5% in late 2007 to 2.3% in late 2009, as a result of the stronger rise in the male unemployment rate at the start of the downturn, which rose from 5.5% in early 2008 to 9.0% in mid-2009. The sharp reduction in the unemployment rate since early 2013, from 7.8% in Feb-Apr 2013 to 5.0% in Feb-Apr 2016 reflects a decline in the unemployment rates of both men and women and is now, for the first time since records began the same at 5.0%. Figure 14 shows that the decline in the unemployment rate for men has been much quicker than for women in recent years. This is largely due to the fact that the decline in the unemployment level between 2010 and 2015 has been stronger for men and across a wider age span than for women (Figure 15). For men, unemployment fell in 2015 relative to 2010 by more than 15% for each age group with the biggest reduction occurring in the 35 to 44 age range where unemployment halved (fell by 51.6%). For females, the biggest reduction in unemployment was among the younger age groups, up to 24 years of age, with a fairly uniform reduction in unemployment for age groups between 25 and 49 years of age – averaging around 25,000 people. It is also interesting to note that while the unemployment level for men declined for the higher age groups (50 upwards) between 2010 and 2015, unemployment levels for women were also lower across the older age groups. The recent fall in the unemployment level for men and women has been accompanied by an increase in the number of men and women who are economically active in the labour market and has therefore also contributed to the fall in the unemployment rate in recent periods. While the number of males in unemployment has been falling at a faster rate than for females since 2010, the growth in the activity level has been slightly higher for females than males over the same period. Figure 16 highlights the contributions made by both men and women to the yearly growth in the activity level. Prior to the 1990s, the increase in the activity level was predominantly due to the increase in female activity, which grew on average by 1.5% per year and contributed 0.57% to the increase in the activity level, while the equivalent contribution to activity levels from males was only 0.03%, growing each year at 0.1% on average. After the mid 1990s, the yearly increase in the activity level was more balanced between men and women due to both a slight fall in the annual growth of the female activity level and a marked increase in the annual growth of the male activity level. Although the number of economically active males has been consistently higher than that for females, the strong growth in female activity since 1971 has closed the gap by more than 66% by early 2016 (February to April). The increase in the activity levels for men and women, between 2010 and early 2016 can largely be attributed to increases in activity for young people between 20 and 34 years of age, as well as people over 45 as demonstrated in Figure 17. The number of economically active men and women in the 20 to 34 year age group increased by 294,000 for males and 330,000 for females between 2010 and 2015, while the number of active men and women in the 35 to 44 age range decreased over the same period by 197,000 and 178,000 respectively. There has also been an apparent increase in the activity of people over the age of 45, with the 50 to 54 age range representing the largest increase in the level of activity since 2010: by 523,000 – a 15.8% increase. The increase in the activity level over the age of 50 represents the largest driver of the growth in the activity level for men and women since 2010, and highlights an underlying shift in the labour market towards older workers. This is partly driven by rising retirement ages as well as an inclination to carry on working past retirement. Female participation over the age of 60 has increased by 21.8% since 2010, almost double that for males, and is likely to be heavily influenced by the increase in the state pension age for females in recent years. The new UK House Price Index (UK HPI) was launched in June 2016 and replaces the previous house price indices separately published by the Office for National Statistics (ONS) and Land Registry. This is a joint production by Land Registry, Land and Property Services Northern Ireland, Office for National Statistics and Registers of Scotland. The introduction of improved methodology and data sources has led to differences in published prices when comparing the new HPI to the previous HPI published by ONS. However, when comparing the respective trends over time, the series show very similar movements, presented in Figure 18. To be consistent with the old HPI series, we have used data relating to the UK for comparing the old and new series. However, for the remainder of the analysis in this section, we have used Great Britain data from the new HPI series, in order to be consistent with average weekly earnings (AWE) data. Figure 19 shows the annual growth rate in house prices for the different countries of Great Britain based on the new UK HPI. Generally, house prices grew strongly in Great Britain before the economic downturn. This was followed by a sharp fall during the downturn, with the annual fall in house prices reaching a lowest point of 15.3% in February 2009, before recovering during late 2009 and early 2010. After a fall in house price inflation in 2011, there has been resurgence in recent years. The housing market in England has strongly driven the Great Britain trend and therefore the 2 series are similar over the period shown. The London housing market has a large influence on the England house price data and partly explains the divergence between house prices in England and the equivalent series for Scotland and Wales. House price growth in Scotland was strong before the economic downturn, while during the downturn, the fall in house prices was less pronounced than the rest of Great Britain. However, since the start of 2010, house price inflation in Scotland has remained much weaker than in England overall. This weakened further in late 2015, with the 12-month rate in Scotland increasing 3.3% in April 2016 compared with 9.1% in England. In Wales, house price inflation since the economic downturn has also been weaker than England and stood at 1.7% in April 2016. Figure 20 shows the path of annual change in house prices, average weekly earnings (AWE) and the difference between the two from 2005 to 2016. Where earnings growth exceeds house price growth, this implies increasing affordability. Before the 2008 downturn, the annual percentage change in house prices was higher than annual weekly earnings in the UK. Annual house price inflation fell from a peak of 9.9% in July 2007 to -15.3% in February 2009. Average weekly earnings growth also fell during the economic downturn; however this was to a lesser extent than HPI growth which, among other things, implies a possible increase in affordability during this period. From 2012 to mid-2013, annual changes in house prices and annual weekly earnings remained similar; since then, house price growth has outstripped earnings growth. This may be explained by supply in the housing market not keeping pace with demand as explained by the Royal Institute of Chartered Surveyors (RICS), who found that newly agreed sales and new buyer enquiries increasing significantly during this period. Affordability has decreased in recent periods, with annual house price inflation at 8.3% in April 2016, while the annual increase in earnings was 2.5%. Figure 21 shows how changing margins between house prices and earnings growth have affected the ratio between the 2, using average weekly earnings (AWE) data. Prior to the economic downturn, the house price to earnings ratio in Great Britain followed an upward trend due to strong house price growth outstripping wage growth, with the average house price up to 8.5 times the average wage at an annualised level in mid-2007. However, during the economic downturn, the persistent fall in house prices outweighed the change in earnings and the ratio decreased, falling to a low of 6.7 in April 2009. The ratio did not markedly increase until late 2013, when a resurgence in house price inflation and relatively slow growth in AWE caused the ratio to increase from 7.2 in August 2013 to beyond 8.0 after August 2015. Figure 22 shows house price growth in different regions between 2005 and 2015, reflecting different market conditions in regions of Great Britain. It shows that the rate of house price growth in the 2005 to 2008 period was strongest in Scotland and London, which had the highest house price inflation of 34.2% and 24.7% respectively. There was also comparatively strong growth in Yorkshire, the South East and the North West. Conversely, the East Midlands recorded the lowest rate of house price inflation during this period at 9.8%. During the economic downturn and immediate recovery period between 2008 and 2012, house prices across all regions rapidly decreased, ending years of increasing prices in the housing market. House prices in the North East had the sharpest decline at 14.2%, compared with an average decrease in Great Britain of 8.5%. In the 2012 to 2015 period, average house prices in Great Britain increased by 14.4%. The North East experienced the lowest levels of house price inflation from 2012 to 2015 at 1.3%. As house prices across England continued to climb during the 2012 to 2015 period, Scotland and Wales lagged behind, this being a reflection of regional market conditions. Figure 23 illustrates the change in the ratio of average house prices to average earnings for each region, using data from the Annual Survey of Hours and Earnings (ASHE). For Great Britain overall, although the house-price-to-earnings ratio has increased since the downturn to 5.7 in the 2014 to 2015 year, it has not returned to its pre-downturn level of 5.9. However there are marked regional differences in conditions, with London far exceeding its level in the pre-downturn financial year of 2007 to 2008, whereas in Wales, Scotland and many regions in the North, the ratio remains far below its pre-downturn level. Examination of the ratio of mean house prices to mean annual earnings also provides an insight into the relative affordability of housing across the regions of Great Britain throughout the period. During the 2004 to 2005 financial year, Scotland had the lowest ratio of house prices to annual earnings, where house prices were 3.7 times greater than the average salary. In comparison, the South West had the highest ratio of house prices to annual salary, where house prices were 6.7 times higher than annual earnings. By the 2007 to 2008 financial year, Scotland continued to have the lowest ratio of house prices to earnings, whereas the South West had the highest ratio at 7.3. In the 2011 to 2012 financial year, post-economic downturn, both the North East and Scotland had the lowest ratio, whereas London became the least affordable region where the house prices were 6.7 times higher than average annual earnings. London continued to be the least affordable region in the 2014 to 2015 financial year, in which the house-prices-to-earnings ratio was 9.2. In the North East, the ratio has declined sharply since the economic downturn and stood at 4.0 in 2014 to 2015. With the house-price-to-earnings ratio broadly increasing since the economic downturn, the average value of mortgage approvals has also seen a similar trend. Figure 24 shows the number of mortgage approvals and the average value of mortgage approvals between 2001 and 2016. Before the economic downturn, the average value of mortgage approvals was around £144,000 (2007). 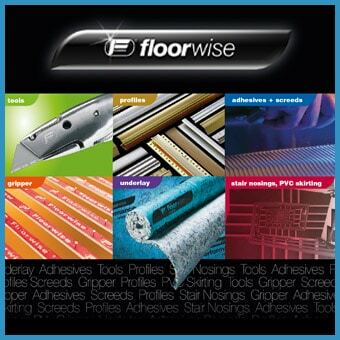 By 2016, the average value of mortgage approvals had increased by 23.3% to around £178,000. This could be partly attributed to the demand for housing outstripping the supply for housing, especially in London, where prices have continued to grow faster relative to other parts of the UK. However, while the average value of mortgage approvals is increasing, the number of mortgage approvals has remained subdued relative to the pre-downturn level, with the number of mortgage approvals falling by 32.8% between 2007 and 2016. Figure 25 shows the proportion of income that is spent on mortgage principal and interest repayments using the Living Costs and Food Survey. While the house-price-to-earnings ratio has been increasing steadily since the economic downturn, the proportion of income that is spent on mortgage principal and interest repayments has been on a downward trend since 2008, following the fall in the bank base rate. This has fed into wider mortgage borrowing rates and debt consolidation among some households. With households paying a smaller proportion of their income on mortgage interest and average weekly earnings increasing, albeit relatively slowly, the mortgage-repayments-to-income ratio has fallen from 19.4% in 2008 to 16.1% in 2014.